Jen helpfully sent me the above link — isn't it fantastic? You don't usually get vampiness AND pockets in the same pattern. (Which has never made sense to me: where do those mankillers keep their red lipstick and extra perfume? I don't see a handbag in this picture, do you?) (It's being listed by JuniperFare Vintage Wears on eBay, click the image to visit the listing.) Jen is also a member of the EVintage Society, check them out! Allison made a prom dress for a bowling pin. That's all I'm gonna say; you need to check out that link for yourself. Lisa sent this astounding raffia-embroidered 1960s dress. If you have a fancy beachy party coming up, you need to visit this auction. Penny sent this dress, which I love. I'm pretty sure I have this pattern, though, so I'm sharing. Isn't that helpful of me? 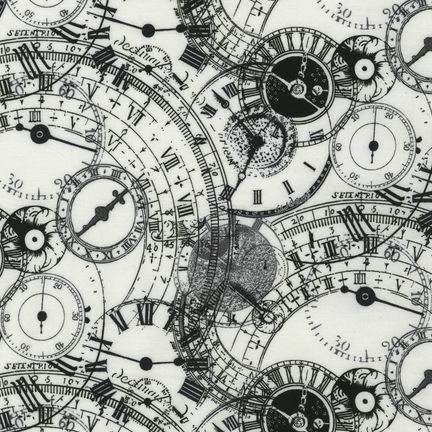 Oh, and apropos of yesterday's steampunk mention, Jonquil found this great clock-parts fabric. I really want a dress of this, and every time I wear it I will look impatiently at my watch for added effect! Kate is looking for a pattern for those Hawaiian-y 1950s halter dresses (like this one). Do you know of a pattern for these? I know you can buy reproductions, but she wants to make her own. I don't mean to bother you, but I can't seem to find info and if anyone would know, it would be you or your readers… No matter what I do, my skirts always turn around on me. I walk, they shift, I run, they shift, I sit still, they shift. Circle skirts, straight skirts, etc, and always counter clockwise if looking from above. I used to think it was interference from my purse, but it happens even if I don't carry one. I figure I must walk unevenly or something, but do you know any way to get it to stay put? I've tried pinning them to my bike shorts (works for circles, but not straight skirts – the skirt still turns below the pin line). Any ideas? I would like to know that answer, too … for me it seems to happen when I'm wearing a bigger size than I ought to (some vintage I will MAKE fit me by sheer force of will, right?). Still about skirts, Sandy is looking for a Halston skirt pattern, which she explains as "the skirt is actually like two in one—there is an inner skirt which is only fastened at the waist, so you can turn the whole thing over and have a second skirt." Do you know about this? Leave a comment, please! Also, it has come to my attention that the "search" function on this page is BROKEN. Like, returns no hits for "Duro" or "shirtdress" broken. I'm not sure why … but if you need to find where I wrote about roller-skating, or buttonholes, or that dress with the crows and the megaphones, or whatever, use Google, and type [YOUR QUERY TERM HERE] site:dressaday.com. That will limit Google's search to just A Dress A Day. There are several kimono pattern designs available to choose from . McCall’s 4953 costume kimono, as well as Simplicity 4080 which is a Geisha costume pattern. Have one 1950s kimono robe with monogram pattern. Pacifica has several authentic Hawaiin garments for the reader searching for a halter dress pattern. Unless it’s a particularly complicated pattern, missing pieces don’t faze me. If it’s something basic, like a sleeve or skirt panel, I just borrow one from another pattern (similar age/style) and tweak it to fit. If it’s a more important piece like a bodice panel, I have no qualms about at least attempting to reproduce it through a combination of borrowed pieces and pure winging-it.I figure, I usually have to adapt stuff to fit better, anyway, right? For Kate:I have been looking for a similar dress pattern, and the closest match I can find is Simplicity 3780. There is also a recently out-of-print pattern you might want to check out – Simplicity 4481. It’s supposed to be a fancy bias-cut evening gown, but I think you could work out how to use the bodice on the skirt of your choice. Good luck! wearing a slip always helps me with twisty problems. it cuts down on the friction between your legs and the skirt fabric especially when wearing tights? Kate – Simplicity 3780 is a great 1950s halterneck dress that’s a reissue of an original vintage pattern. I recently sewed it up into a Porsche dress and it’s a really great pattern, especially if your bust is proportionately larger than the rest of you because with the gathered cups you can just fuse a bigger size up top onto a smaller size everywhere else! Highly recommended. for Laura- I had that problem growing up and into my twenties with any skirt I wore, then after my first child I began getting adjusted regularly by a chiropractor. Apparently it was my pelvis/hips that were misaligned and I haven’t had that problem for the last 3 years, everything stays put now….who knew! Laura – I agree with Mia. I have a high right hip and it causes a lot of my skirts to twist unless I make pattern alterations before sewing up my skirts. I think I read about this in one my sewing books but I can’t remember which one right now…maybe it was Fast Fit: Easy Pattern Alterations for Every Figure. For Kate: Scissorhappy sells a reproduction of a 1950-60’s Hawaiian-style halter pattern with a sarong skirt, see here: http://www.scissorhappy.com/catalog/item/1744458/1174446.htmI actually have the original of this pattern (alas, missing the bodice pieces! ), which also had a full dirndl-type skirt option. No reason you can’t tack on any skirt style you like. You can buy summer kimono patterns at http://www.fabrictales.com. The patterns are Japanese but the sewing instructions are in diagram form so they aren’t difficult at all to follow. I can get confused when the directions are in English and even I have managed to use them. Skirt twirling: they used to make (OMG I’m old) a sort of elastic with rubberized strand on one side that you sew on the inside to the waistband. It clings to your slip or blouse or whatever is between you and the band and helps the skirt stay in place. Like the stuff they put in the band of thigh-high stockings. That is a stunning dress with all the buttons and pockets. Rather a gangster look – you could slip your shotgun down that long pocket and no one would be the wiser. this is your fault, Erin, I keep creating Secret Lives for Dresses. Incomplete patterns: They don’t bother me too much because I also have to make alterations to make things fit. I can draft a facing or skirt piece.If a critical piece (or all pieces!) are gone but the instructions are there with the technical sketch of the piece, I might try to draft the piece if I loved it THAT much. If the instructions were also missing, well, I’d have to love it too much for my own good to use it. I haven’t done much draping but I think I would try to drape the pattern to match the envelope picture.There are some people out there that collect vintage pattern envelopes and make things like buttons or magnets or whatever out of them, too. So a vintage envelope containing nothing is still saleable. I’m A Nidiot; the pattern that’s wanted is, I think, the last pattern on Page 2 of the 50s section of evadress.com; I forgot that there are several similar ones on that page, but the one that’s exactly the same is the very last one on Page 2. Wow, that asymmetrical “gangster moll” dress could really do a number on drunks in a bar; they’d be seeing double trying to figure out why it makes the room seem to tilt. 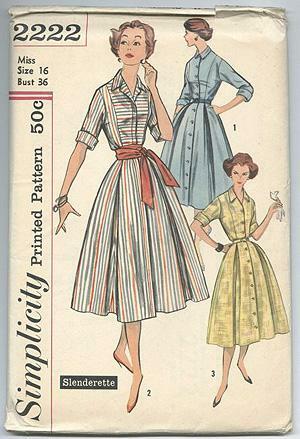 I LOVE that shirtdress with the stripes reversed on the bodice. Very, very extra cute. I really wanted to see a prom dress on a bowling pin, but I got 404.
try http://farm3.static.flickr.com/2146/2487852243_70a65b1b3b.jpgfor the bowling pin dress. That is a direct link to the image. John Marshall’s book Make Your Own Japanese Clothes is a very good resource for making kimonos. It is very clearly written with good instructions and illustrations. Here’s a picture of my daughter in her kimono made from the book’s instructions. Do you guys like my neck longer? Thank you, chantelle. I see now that you are right. Have gone back to original format. 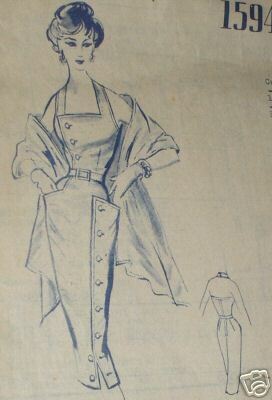 (Interestingly, this pic is from a 1960’s pattern, but with the details cropped out the haircut looks more 1930’s to me.) HAVE A NICE WEEKEND, ALL! I want to second the motion for the “Make Your Own Japanese Clothes” book, it is excellent. I used the instructions to draft up a pattern for a kimono-inspired blouse and it came out beautifully. For the Hawaiian style dress Simplicity has an out of print pattern 4559 that you could order from the website. Ha, I love the prom dress for a bowling pin! I’ve got a duck ball and pin on display in my sewing room, they may get dressed. Many people have the twisting problem with skirts – probably because almost nobody is symmetrical. One leg longer than the other, one hip fuller – any variation can cause a skirt to start swiveling around your body. But, alas, I am very frustrated — I’ve been to two fabric stores and can’t find that fabric locally. equilter.com is sold out and fabrics.com doesn’t carry it. Help! Thanks all for the Skirt help! It sounds like it’s just cause of my wonky shape combined with waistbands not being tight enough. : ) I’ll try a combo of different suggestions and see what works! Threads Oct/Nov 2002 had a Kimono Coat tutorial that might be useful. So I clicked and re-read the crows and megaphones post. There I discovered what started me on my quest to find fabric with elephants in propeller beanies!I guess that will be my first Spoonflower submission when they get out of beta. In the Victoria’s Secret compartment, of course!